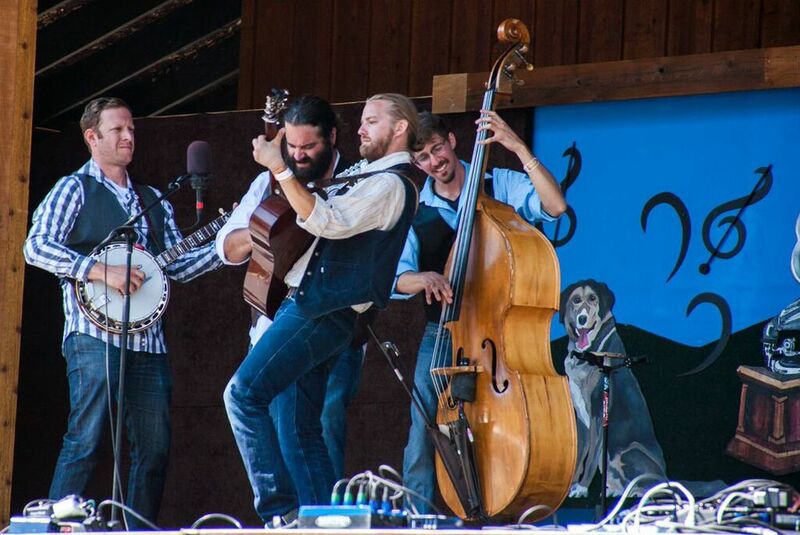 National award winning, Colorado bluegrass. Festival Bookings, Club Gigs, Weddings, Corporate Events, Parties, Just to say hi! With are so excited for a Friday night party in Boulder! Bridget Law will be joining us for some double fiddle fun! Our good friends Caribou Mountain Collective and Bowregard will be kicking off the evening in solid style! We have no-fee pre-sale tickets available, so hit us up if you need one. We think it’s the most fun you can have in Northglenn! Great lineup, great hotel jams - all in a weird hotel! Book your room at the Ramada soon. It fills up fast if you’re staying the night. We’re so amped to be headed up to Steamboat to play and hang all weekend! Get tickets soon, it’ll sell out quickly. Great lineup with Trampled by Turtles, Railroad Earth, Infamous Stringdusters, Billy Strings, RapidGrass and tons more! We’ll be with our great friends Meadow Mountain and Avenhart for a home-town throw-down! Make sure you don’t miss this one! Hit us up for fee-free tickets! Night 1 of our run with The Lil’ Smokies! We couldn’t be any more excited to be out on the road with these guys for a handful of shows. Next stop with The Lil’ Smokies is one of our favorite ski towns to play in, and our first time there in the Winter. The Belly Up is one of the most notorious ski town venues in the country and we can’t wait to play it for the first time supporting The Lil’ Smokies! Vail Valley! We’re coming for you with The Lil’ Smokies! We’ve heard great things about the Ute and are psyched for our last night supporting The Lil’ Smokies. Fresh off Lil’ Smokies tour, we’re gonna be ready to burn it down in Lyons. Whoooo yeah! A stacked lineup with Greensky, Railroad Earth, Infamous Stringdusters, Leftover Salmon and tons more, in Vegas! Hell yeah. You're gonna want to be at this one. We’re pumped to be back at Palisades Bluegrass fest with a fully stacked lineup, all weekend long. We’ve had a love affair with the Mish for as long as we can remember and this will be our first time taking the stage. We’ll be joining our great friends Trout Steak Revival and The Sweet Lillies for an amazing night of music. Contact information and Electronic Press Kit is available below. To inquire about booking The Lonsesome Days, please email lonesomedays@gmail.com. You can also call or text 303.618.4506. We look forward to speaking with you. Download our EPK here. If you need something else, please use the contacts on this page and we'd be happy to send you additional assets. Connect with us on Facebook, Instagram and YouTube to get updates on shows, our upcoming album and random happenings of the band.